I’m a sucker for a self-conscious farewell. I bought final issues of comics I’d never prevoiously read. My best Doctor Who memories were the regenerations. As a student, my favourite Shakespeare was The Tempest. And look! Here’s Gary Barlow as Prospero, drowning his songbook, letting Caliban free to hang out with Oasis at Glasto, moving on and leaving behind him maybe the most self-important single a boyband has ever produced. But, slapdash and grotesque though it is, I like it. I’d happily call it their best single if it wasn’t for all the really terrible bits (The whole “invincible” bit, for a start). Why? First, though this isn’t actually their final single, overdramatising a split is probably what the fans need and deserve. No hollow thanks and mutterings about really special plans for the future from men who are clearly hating every second of the job they’re quitting. To the fans – these fans of this band especially – a split was armageddon, or at least to be played as it. Take those feelings seriously – give the fans some catharsis! “Never Forget” does this, and then some. 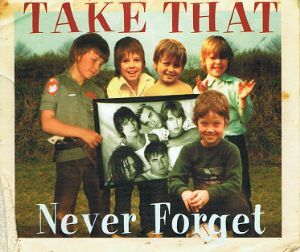 Second, the combination of Barlow, Steinman and Brothers In Rhythm makes “Never Forget” a single that sounds like very little else. We’re about to enter a dark time in which “epic” in British pop is going to be codified in terms of string sections, stately plods, and pained rock vocals. Here is a parallel vision for bigness in pop: gospel choirs and boyband harmonies, stadium rock choruses emerging out of elephant-legged R&B. It’s blowsy, absurd, and unsustainable but glorious when it works – when the chorus hits you can see the fireworks shooting up from the stage. Finally – and this is the important bit – the whole teetering folly of “Never Forget” is just a delivery system for Gary’s probably finest, and certainly wisest chorus. “Never forget where you’ve come in from / Never pretend that it’s all real / Someday soon this will all be someone else’s dream”. This is really good, grounded advice, not just as a pop fame survival guide, but as a way of staying level-headed about the transient things in life. It’s rare for a group to realise their moment has passed, rarer for them to acknowledge it, and in this chorus Take That are singing not just about themselves, but about their fans, and about fandom and youth. Researching this song I watched its home-movies clipshow video on YouTube – a visual farewell tour, not an uncommon gambit since splitting bands become harder to convene for video shoots. Below it though were a surprising number of comments from kids, who had turned the song into school leaving videos – some secondary, most primary. They weren’t posting the videos themselves (thankfully) but I was surprised how moving I found the idea of it – 11 and 12 year olds taking this song, an oldie for them, and turning the self-mythologising into something they could use to navigate their own life changes. We all want to turn our lives into stories – “Never Forget” is a song about exactly that, and works as both a tool for doing it and a warning of the consequences. Take comment 2 as “gospel”.. Sticking with my 6.. childhood mark inflation isn’t a problem here as I never “got” TT at the time. But I wasn’t their target audience so swings and roundabouts. Besides, I burnt all my cynical bridges early on. Nearly everything in 1989 got 3 or less, except Black Box, Soul II Soul and Lisa Stansfield, the latter being mostly because I thought it was great defiance of nature’s laws that someone from Rochdale – or any Accy-like northern milltown you bring up – had a sense of glamour. I was amazed reading about the Hacienda as a teenager, having been at nursery school when it peaked – I just thought all people did in Manchester was watch Coronation Street and cry. In the interests of balance and sanity, I’ll put this back to a (good) 5 and say no more except thank you, goodnight, and sorry for nearly ruining this thread being such an oaf! … a piece of which Steinman is inordinately fond, it seems. Its victory lap sound probably prevented this from becoming a hit in the US where of course they were never more than one hit wonders. It’s a decent song in the proper context though – I’d be willing to give it a 7. What I don’t think anyone’s mentioned so far is that although this was loaded with significance as being about Robbie leaving, that appeared at the time to be simple serendipity because he actually departed in between the record being released to radio and so on, and then its actual release. Certainly I remember the only interest in it initially came from the fact Howard was singing it. That’s why Robbie’s on the sleeve and in the video, but by the time they started actively promoting it (I remember their first post-Robbie interview was the weekend before its release on the otherwise long-forgotten Steve Wright’s People Show on Saturday night BBC1) he’d buggered off. 13-year-old me hated this, but 31-year-old me quite likes it. Never knew it had Steinman’s imput, nor did I realise the lyrics weren’t ‘Never Forget where you’re coming from’. Think I’ll give it a six. “Never Forget where you’re coming from” doesn’t make much sense. Linguistically and grammatically, it’s a load of shite. I really like “where you’ve come in from” – I don’t think it’s clumsy. It’s making the point that the thing you’re part of is bigger than you are – we are all outsiders, coming in from somewhere and able to leave (or be kicked out) as quickly. Re 35: I always suspected that this was written specifically as TT’s great group farewell. Barlow doubtless saw this as the point where he’d make for the exit and a George Michael-style solo career, but when Robbie left first this meant he had to hang on a bit longer so it didn’t look as if RW had split the group. .. except Rob did not leave, he was told to go. 100 years from now, who’ll know the difference? Glen Matlock for a kickoff. Will he be alive in 100 years’ time? Paddy Power taking bets now. “I have no plans to die” – that’s the spirit. Avoid dead chickens, folks! How about Jet Harris and Tony Meehan, independantly, from The Shadows. Just my luck… I wait three Popular years for entry #725, and now it’s all going to happen while I’m on holiday. Expect my by-then-obsolete thoughts at around the comment-300 mark on July 15th! Sorry Rory – it’s about half-finished but I’ve been having to do a lot of work writing, and the entry has ended up quite long. The entire subterranean history of London club-based music from Ken Colyer across to Alexis Korner is a blizzard of mutual disaffection, really. Everyone thought everyone else was playing the wrong sort of something. That reminds me, I’m supposed to be writing a book on this very subject (not pop stars jumping ship but the strangely logical anti-nexus of Brit blues boom, free jazz and psychedelia). That book sounds awesome, punctum! No worries, Tom – it’s been great to see the flurry of activity around here lately. I feel all Popular-ly reinvigorated. If I can get O2 in Shetland I’ll try and post a comment from my phone. Mind you, my comment on it is only a few paragraphs long… the other recent threads used up some of what I might have said. By the way, it’s a 4 for “Never Forget” from me. Take that, Take That! @46, Lonepilgrim. Arthur Sullivan spent most of the 1880s trying to ditch Gilbert and Comic Opera (esp. after being knighted for his more hifalutin’ stuff). A right Gabriel, Sylvian, Albarn he was. Never Forget was the third (and final) single from the Nobody Else album and the only one to be released (albeit it remixed form) after the album’s release. Nobody Else, with the exception of two songs (Back For Good and an oddly haunting acoustic piece sung by Mark Owen) is an album of two halves. One half is of `Sures`, soul influenced upbeat numbers that have dated hideously and a second half of `Never Forgets`; ridiculous earnest Gary Barlow solo numbers aimed at proving he was a serious artist – the title track is exceptionally hideous. In the CD booklet Barlow has a full page photograph while the rest of the band get quarter of a page each. Given that it was Mark and Robbie the girls still wanted this is telling – Nobody Else is virtually a solo album. There was a script here. Gary Barlow was set to `do a George Michael` and outgrow his pop roots to become a solo superstar. Except – it all went wrong. The first mistake was that the other four Take Thatters were not Andrew Ridgely; Orange and Donald were relatively disposable but Mark Owen was the pin up and Williams the best voice. The second mistake, which Barlow’s camp could not have forseen but which they reacted to badly, was that the musical scene was changing. Gary Barlow had a seat marked at the same table as Elton John, Phil Collins and Sting and the rock world would shortly reject these dinosaurs for a new breed of Gallaghers, Albarns and Cockers. At the same time (as this blog will soon show) the world of pop moved away from earnest hearthrobs like Barlow to brazen, tabloid baiting superstars (it’s pretty obvious which girl band I have in mind here). It’s worth noting that Robbie Williams would owe a lot of his subsequent success to the fact he could straddle both camps. For Gary Barlow matters would be made worse by the fact that, by the time he finally divorced his pop band and was in a position to do a George Michael, George himself had returned with what (for me anyway) was his strongest collection of songs. A final point, while Never Forget was at number one Boyzone spent two weeks at number three with So Good. It was not the first time Take That and Boyzone had been in the top five simultaneously, nor would it be the last. A kind of no more worlds to conquer feel to this.Though the signs of the end had probably begun with the success of Back For Good. I liked it in 95 but now its a bit of a chore to listen to outside of the chrous.It doesnt stand up as well as BFG now. They throw a lot at this, don’t they? Including, inexplicably, Howard. Sadly the effect is to leave you listening to the straining verses and having your mind wander to how much better it might have sounded if they’d given it to Robbie, who really stands out in the bridge. But the chorus of course is mega. Just before this review was posted I was at the year 6 leavers’ performance at my boys’ primary school, and this was the last number. You’re right, this is where it comes into its own as a tearjerker, and not just for the parents – there were a few dabbed eyes among the children too. This is a karaoke killer. Everyone assumes it’ll be a knees-up singalong – and it is, but only once every 90 seconds. The problem is those meandering verses, dragging their feet like a schoolkid on the first day of term. Someone like Elton might be able to sell the melody by force of personality alone, but poor old Howard (and our karaoke troop) will never manage it. The chorus gets a 7, the rest of it a poor 4. Interestingly, the album version is a lot better, losing the ridiculous choirboy intro and – more importantly – allowing Robbie to vamp all over the coda. Some of his ad-libs are kept for the single edit (which, confusingly, is longer) but they are poor facsimiles, sung by the rest of the band with much less vigor or personality. The group was truly over the day he got his marching orders. This was a great song very epic and full on with a nice message to it. Epic and a worldwide hit following on from the global chart topper Back For Good. Different and unique from a boyband doing something a bit different in sound and length. Always good when a statistic randomly occurs to you. For all that the ups and downs of their careers have intertwined and despite countless chart toppers by each and two near misses; as of mid 2016 Never Forget remains the last time Gary Barlow and Robbie Williams feature on a number one single together.